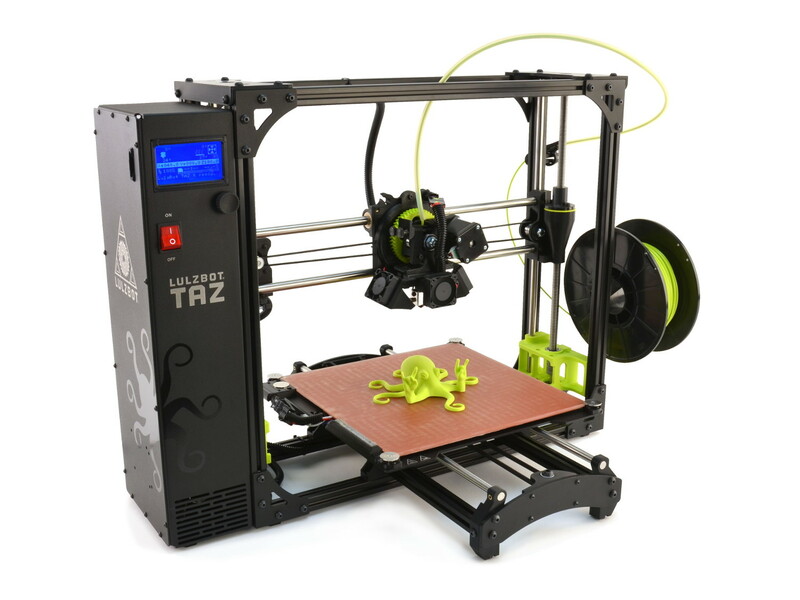 Engineers, designers, educators, and makers agree: The LulzBot TAZ 6 is the most reliable, easiest-to-use desktop 3D printer ever, featuring innovative self-leveling and self-cleaning, and a modular tool head design for flexible and multi-material upgrades. 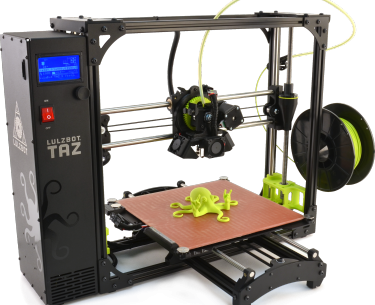 With proven 3D printing technology and one of the largest print volumes in its class, the LulzBot TAZ 6 is ready to work. Also available for purchase through Official LulzBot Resellers. Sold Out For Your Location? Filament is not included, click here to select some to include with your order. LulzBot Desktop 3D printers are certified by the Free Software Foundation (www.FSF.org) and meet the Open Source Hardware definition (www.OSHWA.org), meaning you can see it all, from the bill of materials down to the software source code. Our LulzBot 3D printer was the first hardware product, and remains the only 3D printer brand, to receive the Free Software Foundation's Respect Your Freedom certification and meet the Open Source Hardware definition. This means your LulzBot TAZ uses proven technology developed collaboratively. It also means you are free to adopt the latest and greatest technology being developed across the 3D printing industry, from new software programs to experimental materials.
" If you want a serious machine, you won't find a better 3D printer on today's market - whether you need to create small pieces or one large part." "With it’s self-leveling and self-cleaning mechanisms, along with a large build envelope of 280×280×250mm, the TAZ 6 is a workhorse printer that will produce excellent prints consistently. The TAZ 6 also comes equipped with the v2 Hot End, capable of printing in a wide variety of materials ranging from general purpose plastics to conductive PLA and ABS, Nylon, Polycarbonates and Alloy 910." "The TAZ 5 represented the state of the art for FDM 3D printing, and the TAZ 6 does nothing to lose that crown. It is the best FDM 3D printer we have tested. While print quality remains the same, the TAZ 6 is more reliable and easier to use than its predecessor. Plus, the self-leveling print bed and extruder cleaner make printing more consistent and reliable. ... The TAZ 6, though, is the king of the hill when it comes to 3D printing for the well-heeled enthusiast, experimenter or professional who wants fast, reliable 3D printing." "Even if you're new to printing, there really is nothing to fear as everything you need to set up and use the LulzBot TAZ 6 is in the box, from print tool kit to printed guides." "The LulzBot TAZ 6 has been the single best out-of-the-box experience of any 3D printer I've ever used... Every detail feels like it's been purposefully put there. Nothing is out of place." "The LulzBot TAZ 6 scored very high for build quality and reliability, and that’s not surprising given the fact it received reviews describing it as “built like a tank” and “it’s metal body is rock solid.” Furthermore, users of the TAZ 6 have almost unanimously given it 5 stars for print quality." "The LulzBot TAZ 6 is, in my opinion, the most complete 3D printer currently on the market." "The TAZ 6 automated features and range of software options exist to make the entire printing process as stress-free and as easy as possible. It’s a perfect model for serious 3D professionals who insist on high quality, versatility, and reliability." "The auto-leveling system brought over from the LulzBot Mini is an incredibly powerful feature that will save the user a lot of headaches and downtime due to bed leveling issues." "The LulzBot TAZ 6 is clearly the pinnacle of development of the LulzBot TAZ printer line, with hassle-free printing due to its auto leveling and nozzle cleaning. The TAZ 6 is great for beginners and advanced users alike."